The Anatolian Shepherd Dog is one of the most majestic and noble animals in the service of man; still being used in the rural districts of Turkey as the shepherds' indispensable companion and front line of defense of his livestock from predators. Without the aid of the Anatolian Shepherd Dog, the Turkish shepherd would be less able to defend his property and flock from wild animals. 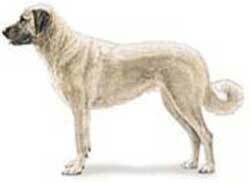 Such dogs are found from the Turkish Anatolian plateau right on though to Afghanistan. Large, upstanding, tall, powerfully built, with broad, heavy head and short dense coat. These are an active breed used originally as a guard dog for sheep. They are hard working and capable of enduring extremes of heat and cold. Their temperament is bold, but without aggression, naturally independent, very intelligent.